It has been widely noted that both "the American intelligence community" (approximately 15 different agencies) and the various military and civilian agencies in charge of fighting terrorism (at least 40 of them) utterly failed to anticipate, prevent or minimize the severity of the devastating terrorist attacks on civilian and military targets in New York City and Washington, D.C., on 11 September 2001, despite the facts that every year the United States spends approximately $30 billion on intelligence-gathering and analysis, and another $11 billion on counter-terrorism. But the "feds" weren't the only ones taken by surprise on 11 September 2001. So were the New York Police Department (NYPD), which of course maintains at least one "Intelligence Division," and all of the security firms that had clients at the World Trade Center (WTC) complex. There's an important parallel to be drawn here: in the same way that the CIA and the National Security Administration (NSA) have devoted far too much of their money, time and personnel to intercepting electronic communications and using satellites to take increasingly sophisticated photographs, the NYPD and the city's numerous security firms have devoted far too much of their money, time and personnel to laptop computers, digital radios, microwave transmitters and surveillance cameras. It might be said of both the CIA and the NYPD that -- if the taxpayers agree to continue funding them -- they (the CIA and the NYPD) should assign more agents to "the field," to "walking a beat" -- and leave the hi-tech spy gadgetry alone. Increases in fighting and abusive behaviour in an East Lothian town have cast doubt on the effectiveness of closed circuit television. Traders in Haddington said the CCTV [closed circuit television] system had done little to reduce incidents of drug dealing and abuse in the area. Police were called out last weekend after a report of a youth in a white car "driving like crazy" in the town centre. However, when police attended the scene, the trouble had stopped and no-one was willing to come forward. In a second incident, police were called to a fight outside the Gardener's Arms public house, but when they arrived the people involved had dispersed. The criticism comes as a review of CCTV systems in East Lothian is under way. Traders are [expressing] disappointment the CCTV has not done more to prevent crime. One said it had produced "little result". WASHINGTON (AP) -- At Columbine High School this fall, teachers can look forward to emergency response drills and crisis management guides. In a few weeks, a "threat assessment manual" prepared by the Secret Service arrives [...] Across the nation, schools have reacted to campus shootings with a mix of tightened security and old-fashioned nurturing. Metal detectors, video cameras and 24-hour hot lines are going into operation [...] Joe Pizza, principal of Silver Bay Elementary School in Toms River, New Jersey, said his school has a video camera trained on visitors as they pass through the front door. "Even though the security camera is more cosmetic than anything else, it does give parents peace of mind," he said. 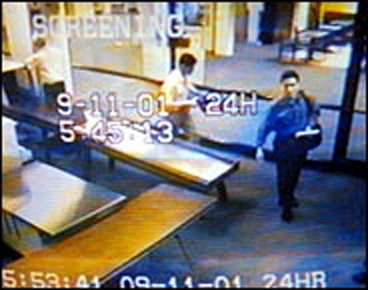 And yet, in the aftermath of the 11 September attacks, the TV screens, newspapers and computer terminals of New York City and the rest of America are filled with irrational calls for the installation of more surveillance cameras and for the increased use of face recognition software to "enhance" the performance of these cameras. (There have also been calls for spending even more money on the CIA, the NSA and the FBI, so that these "under-funded" agencies can make more expensive versions of the same mistakes they made prior to 11 September 2001!) 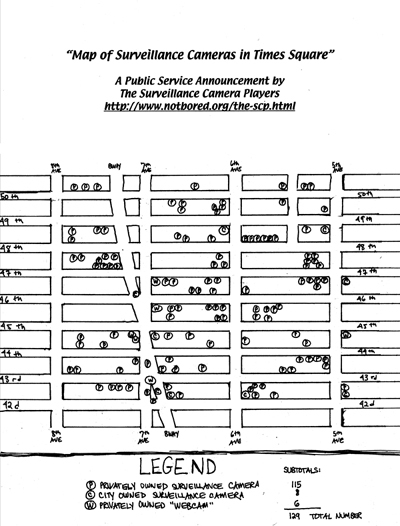 In the 16 September 2001 issue of The New York Times, our old friend, ex-Chief of the NYPD Howard Safir, was described as being in favor of the "installation of 100 or so [more] surveillance cameras in Times Square." (It's unfortunate that the reporter from The Times didn't ask Safir how many cameras are already installed there, because the matter is the subject of some conjecture.) These new cameras, Safir was reported to have said, "should be integrated with biometric facial imaging software, allowing the images of all pedestrians to be compared with photographs of known terrorists." But Howard Safir, the former New York City police commissioner who is now consultant to the chairman of ChoicePoint, a security information company, warned of embracing a "bunker, bomb-camp mind-set." While acknowledging, for example, that turning Times Square into a pedestrian mall might be the most effective countermeasure to car bombs, he said that such a step would only signal defeat. "That's basically caving to terrorism," he said. Suppose this magically effective face-recognition software is 99.99 percent accurate. That is, if someone is a terrorist, there is a 99.99 percent chance that the software indicates "terrorist," and if someone is not a terrorist, there is a 99.99 percent chance that the software indicates "non-terrorist." Assume that one in ten million flyers, on average, is a terrorist. Is the software any good? No. The software will generate 1000 false alarms for every one real terrorist. And every false alarm still means that all the security people go through all of their security procedures. Because the population of non-terrorists is so much larger than the number of terrorists, the test is useless. This result is counterintuitive and surprising, but it is correct. The false alarms in this kind of system render it mostly useless. It's "The Boy Who Cried Wolf" increased 1000-fold. I say mostly useless, because it would have some positive effect. Once in a while, the system would correctly finger a frequent-flyer terrorist. But it's a system that has enormous costs: money to install, manpower to run, inconvenience to the millions of people incorrectly identified, successful lawsuits by some of those people, and a continued erosion of our civil liberties. And all the false alarms will inevitably lead those managing the system to distrust its results, leading to sloppiness and potentially costly mistakes. Ubiquitous harvesting of biometrics might sound like a good idea, but I just don't think it's worth it. So what's with up people like Howard Safir and those who would "fight terrorism" by spending more money on surveillance cameras and the agencies that put so much faith in them? Why aren't people like Safir learning from history? Why are they proposing more of the same instead of admitting the obvious, which is that these schemes just don't work and that new "radical" ones have to be tried? Is it because they are incapable of logic or just plain stupid? Listen to people like Defense Secretary Donald Rumsfield and so-called "President" George W. Bush: like Mr. Safir, these are stupid men, in way over their heads. But this doesn't fully explain why they are consciously putting forth proposals that obviously won't work. WASHINGTON (AP) - The administration began a new drive Monday to persuade Congress to grant President Bush the authority to negotiate trade agreements, telling lawmakers passage would help the fight against global terrorism. U.S. Trade Representative Robert Zoellick said supporters of legislation to let the president negotiate a hemisphere-wide free trade agreement and a new round of global trade talks should know within two weeks whether the votes are there for passage in the House. Zoellick said the legislation would serve as a major signal that the United States does not plan to retreat from its global responsibilities, including defense of free trade against terrorist threats and opponents of globalization. "On Sept. 11, America, its open society and its ideas came under attack by a malevolence that craves our panic, retreat and abdication of global leadership," Zoellick said in a speech promoting benefits of free trade. "This president and this administration will fight for open markets. We will not be intimidated by those who have taken to the streets to blame trade - and America - for the world's ills," he said. "The global trading system has demonstrated, from Seoul to Santiago, that it is a pathway out of poverty and despair." And so we propose that, instead of being allowed to wage war against the people who allegedly attacked it, the government of the United States -- a rogue known for "going its own way" on such matters as the Kyoto climate accords, the "Star Wars" missile defense system and the embargo of Cuba -- should be constrained to join the rest of the world. The US government should ask the World Court to convene a special session at which all those who believe that they have legitimate grievances against the United States and/or its military forces can be heard. The judges at these trials should have the power to subpoena witnesses and documents, and conduct thorough and unimpeded investigations into the charges brought before it. And, if and when it turns out that prominent American political leaders have in fact committed crimes against humanity, they should be properly punished, no matter who they are. We have faith that, when justice is finally done, there will no longer be popular support for whatever terrorists continue to operate. If our proposal seems naive or "impossible to put into practice" -- if it seems at odds with "the way things are," or, rather, "the way things will have to be after 11 September 2001" -- this only proves how important it is to change everything.